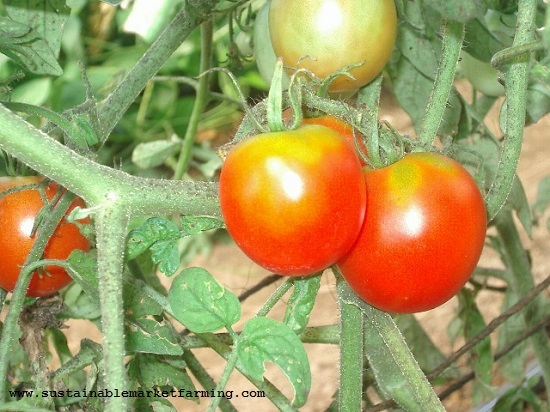 Farming Conference Tips, Hoophouse Cool Season Crops slideshow. I’ve just been on an intensive conference hopping jaunt, three weekends in a row with not much time at home mid-week. One notion I heard discussed is the “Actionable Nugget”. It’s an idea you learn from someone else that inspires you as a possible solution to a problem or challenge you’ve noticed. I’m going to share some I picked up this month. 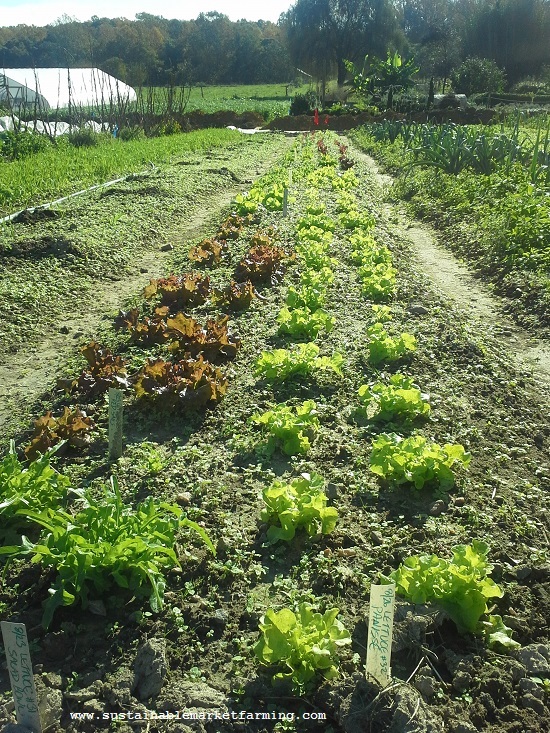 First I’m going to share my half-day presentation on Hoophouse Production of Cool Season Crops. To view it full screen, click on the diagonal arrows icon. Use the forward pointing triangle to move to the next slide. There are a lot! It was a full afternoon! 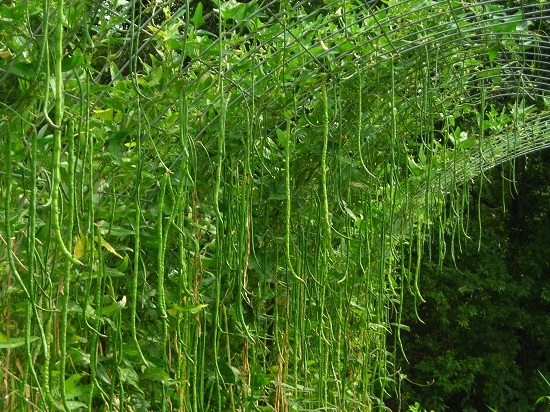 Asparagus Beans (Asian Long Beans, Yard-Long Beans) as a summer hoophouse crop. 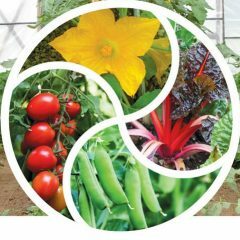 I got this idea from a Year-Round Organic Vegetable Production workshop at the Virginia Association of Biological Farmers Conference. It was presented by Rick Felker of Mattawoman Creek Farms on the Eastern Shore of Virginia. 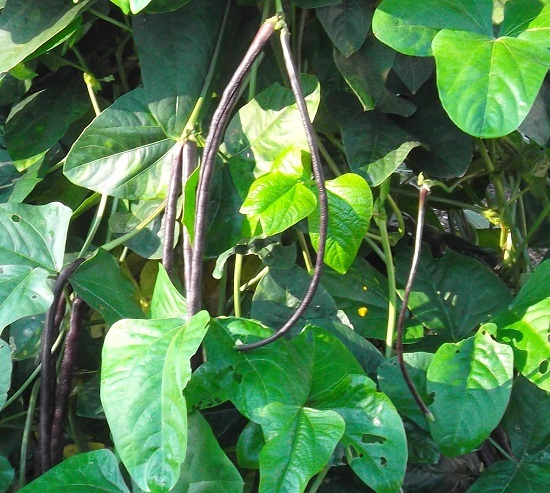 Rick said that Asian long beans are a star crop for them, and produce extremely high yields compared to outdoors. Yes, they need trellising, and yes, they need frequent harvesting. On the plus side they are a legume, so they are adding nitrogen to the soil the whole time they are growing. At Mattawoman Farm, they harvest these from June to October. In recent years we have not been growing bean seed crops in the summer hoophouse as we used to do. Last summer we grew Iron and Clay cowpeas as a cover crop, but were disappointed to need to cut them back every 6 days, because we’d decided not to stake them in any way. Sulfur: The Forgotten Nutrient, Secret Ingredient for Healthy Soils and Crops. At the Future Harvest Chesapeake Association for Sustainable Agriculture Conference, I much appreciated this workshop by Ray Weil. A whole workshop on one element! When deficient, the plant has symptoms resembling nitrogen shortage. It caused me to wonder how often I have made this mistake. Brassicas and legumes are the crops to pay closest attention to. I learned that the standard soil test for sulfur is fairly meaningless – I have been putting my faith in a poor source of information. The key piece of information from Ray Weil is that with a S shortage, the yellowing starts on the younger leaves, which is opposite to nitrogen shortages, when the yellowing begins on the older leaves. S-deficient plants will be thin, spindly and slow-growing. The leaves will be high in nitrates, because the poor plant can’t use all the N it has absorbed from the soil. I already know from winter hoophouse growing that high levels of nitrate are not healthy. Legumes cannot do a good job of fixing nitrogen if S is too low. Sulfur shortages can affect the nutrient density of the crops, the protein level in beans. Now I know what to look for and what to do if I find the problem. Add 5-10 pounds per acre of S if plants seem deficient. Is this an unpollinated squash or one with Blossom End Rot? At the same FHCASA conference, I learned about cucurbit BER in a workshop by Emily Zobel. I had not known cucurbits could suffer from blossom end rot, which is a problem caused by limited calcium uptake, often in cold weather and when water supplies are too variable. I do see a little BER on our first hoophouse tomatoes to ripen, but the plants quickly grow out of it as the weather warms up. 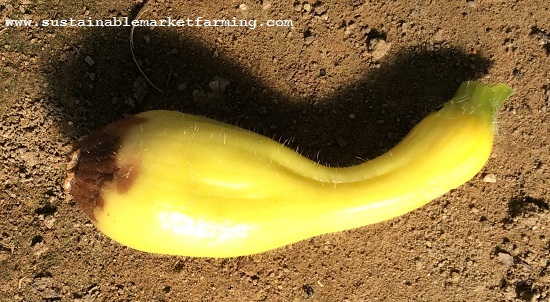 The photos of young yellow squash Emily Zobel showed looked just like what I have been thinking was lack of pollination!! Now I will need to see if encouraging the plants to take up more calcium can solve the problem. This “actionable nugget” arrives in good time for this growing season! Hoophouse tomatoes with yellow shoulders. Glacier or Stupice. From a workshop on Organic Soil Management for High Tunnels at the Southern Sustainable Agriculture Working Group Conference, presented by Krista Jacobsen, I learned some valuable tips about dealing with salt build-up in hoophouse soils. – she referred to hoophouses as “irrigated deserts”! I also learned about yellow shoulders on tomatoes. Previously I had read that the green/yellow shoulders were (unfortunately) genetically linked to good flavor in some varieties. At this workshop I learned that yellow shoulders (as opposed to green), can be a sign of potassium deficiency. Temperatures above 90F can also be a factor. The determinant hybrids have less of a problem than other varieties. Excess magnesium can be a factor, as can the choice of variety, a virus infection, pH over 6.7. Our pH isn’t over 6.7. Ideally, the grower would increase the magnesium to calcium ratio to 1:6 or 1:4, and/or increase the potassium. Perhaps we are short of magnesium. I will need to study our soil tests more carefully. A carpet of weeds, but the crop is easily seen! In this SSAWG workshop by Daniel Parson, I learned a technique for training newbies on weed control: Make them get down on the knees and point to and touch the crop plants before hoeing or pulling weeds. He says : “If you can see the weeds without getting down on the ground, you’ve waited too long! ” Weeds should be dealt with while tiny. Bring your trainees back in a week to to see the results of their hoeing. I like this idea! Too often it is hard for new workers to learn from their experience because they don’t study and critique their work as they learn! Ellen Polishuk gave this workshop, and I went because I had both enjoyed and been challenged by Ben Hartman’s Lean Farm book. I wanted to hear someone else’s perspective and remind myself of the best bits. To my surprise, one idea that stuck out was to work in 90 minute chunks, with short breaks (or longer meal breaks). I’m not sure I fully embrace this idea, but I’m mulling it over. 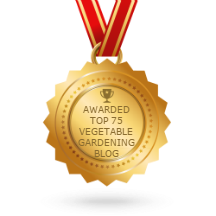 Author farmerpamPosted on January 30, 2019 Categories Events, hoophouse, Slide showsTags FHCASA Conference, hoophouse crop rotations, hoophouse succession crops, Hoophouse winter vegetables, nitrates in leafy greens, season extension, SSAWG Conference, VABF Conference1 Comment on Farming Conference Tips, Hoophouse Cool Season Crops slideshow.